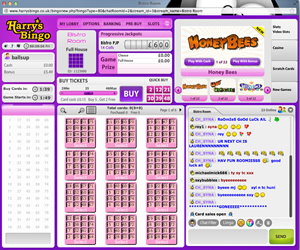 When we visited Harry's Bingo we were first impressed with the bright and bold homepage and glitzy appeal. It's nice when sites are brave with their themes and here the information is jumping off the screen at the player. The homepage is full of bright colours, promotional offers and information, all you have to do is sign up and start playing to take advantage of it all. Running on the well-known Cozy Games software as part of the Super Bingo Network, Harry's Bingo offer all sorts of sign up bonuses, but they change all the time so make sure you take a good look at the homepage to see what you can claim when you register. 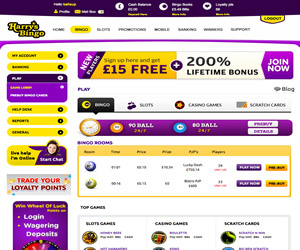 The sign up process takes no time at all, and Harry's Bingo regularly has no deposit sign up bonuses on offer, to give you a chance to try out the games before you part with any cash. When you are ready to make a deposit, Harry's Bingo offer a selection of payment methods, including debit/credit cards and UKash. Points to note are that a) the welcome bonus is not instantly credited to your account (you have to validate your account through a welcome email and then complete your profile to receive the full no deposit bonus), b) if you have accounts with other brands on the network you may have issues registering with the brand (see full Super Bingo Network sites here),c)the wagering requirements are confusing and vary on whether you choose cash or bonus options, d) the minimum withdrawal is £50 and you must have deposited at least £25 before you can withdraw and finally e) unless you have made a deposit, you may find ticket purchases restricted in numbers and in the rooms. Harry's Bingo offer both the 80-ball and 90-ball versions of the game on the Cozy games software and you can access the rooms from the lobby. The product does have the facility to offer 30 and 75 ball too, they simply weren't available at the time of the review. The game screen plays in a pop out window, and the cards take centre stage, right in the middle of the screen. Purchasing options are above the tickets, and chat, with plenty of chat options are to the right of the screen. At the top of the screen you'll see all the game information, account and game options and a selection of mini-games to play. The mini-games on the game screen play within the bingo screen, and that does make it easy to keep track on all your games. There is also a selection of slots, casino games and instant wins to play from the homepage, and they are pretty popular with players. Cosy is certainly the best word to describe the software, as it's definitely not as dazzling as you would expect from some of the more well known software suppliers, but saying that small and cosy isn't a bad thing and the chat rooms are very friendly, giving a real community aspect to the site. Regular promotions, and slot promotions keep things fresh at Harry's Bingo, and they revolve around tournaments, deposit offers and big bingo games so it's worth keeping track. There are also specials such as fixed pot games, and jackpots both in the bingo rooms and on the slots, so there's always the chance to pick up a great wedge of cash if your luck is in. Overall, Harry's Bingo misses out on in terms of razzmatazz and sleek software, it makes up for in its friendly, community feel. We prefer our bingo sites a little more busy. Harry's Bingo had just two types of bingo game to offer when we reviewed the site, 80 and 90 ball games. However the software used is able to offer 30 and 75 ball too. Wagering requirements with Harry's Bingo are variable dependent on both the games you are playing and the bonus option you have chosen. You can find all the details of these in the FAQ section of the site under the Withdrawal Rules section.